Whether classified as device drivers or software drivers, they are small software programs. Drivers are crucial to the communication between your hardware devices, software and operating system. Hardware, such as scanners, requires specialized commands, but software sends more generic instructions. When you hit print in Microsoft Word, the command is translated by the driver into a command that the printer understands. Some devices might function in what is called "generic mode" without drivers; for example, your display might perform only in low resolution mode. This means you are not getting your money's worth out of the investment you made in your hardware. If you upgrade your operating systems, purchase a new computer or if your hard drive crashes, you will need to install the correct drivers. They will help ensure your system continues to be stable and operate smoothly. Drivers are susceptible to corruption; if this occurs, to your modem driver for example, your internet connection will not work properly. Companies often update their drivers more than once a year. A major reason for an updated driver to be released is to fix a bug. This obviously will enhance your equipment's performance. As well, updated drivers can bring with them new features. By ensuring you have the most up-to-date drivers, you can be sure to get the most out of your PC. A processor in a computer running Windows has two different modes: user mode and kernel mode. The processor switches between the two modes depending on what type of code is running on the processor. Applications run in user mode, and core operating system components run in kernel mode. 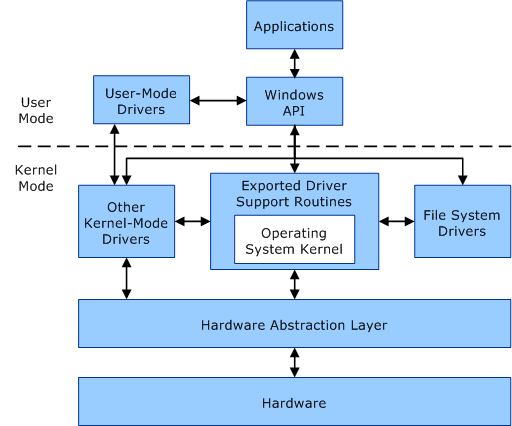 Many drivers run in kernel mode, but some drivers run in user mode. Device drivers, particularly on modern Microsoft Windows platforms, can run in kernel-mode (Ring 0 on x86 CPUs) or in user-mode (Ring 3 on x86 CPUs). The primary benefit of running a driver in user mode is improved stability, since a poorly written user mode device driver cannot crash the system by overwriting kernel memory. On the other hand, user/kernel-mode transitions usually impose a considerable performance overhead, thereby prohibiting user-mode drivers for low latency and high throughput requirements. Kernel space can be accessed by user module only through the use of system calls. End user programs like the UNIX shell or other GUI-based applications are part of the user space. These applications interact with hardware through kernel supported functions.